Thursday morning, the first golf major of the year got underway. The Masters is unlike any other tournament and it's a must-watch not just for golf fans, but for sports fans in general. For any Canadians watching the tournament, you'll want to keep an eye on Corey Conners. 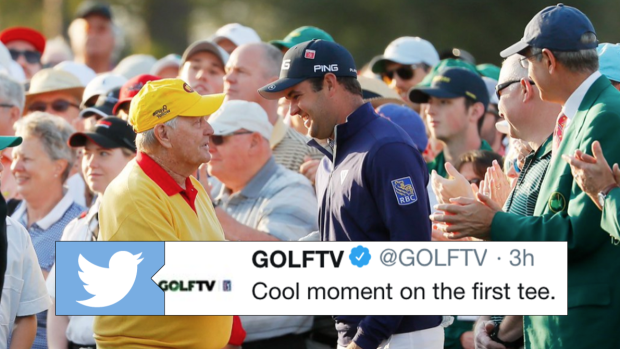 The 27-year-old won the Valero Texas Open to earn the last Masters invite and ahead of the first round, he shared a really cool moment with the legendary Jack Nicklaus. Cool moment on the first tee. There was a huge ovation for Corey Conners on the first hole this morning. Every Canadian fan seemed to be around that tee. Conners and all of Canada are hoping his incredible week continues at The Masters and he can at the very least make the cut to play into the weekend.